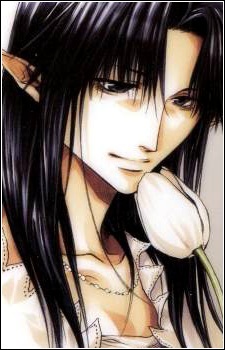 In the anime and manga Saiyuki, Yaone is the youkai prince Kougaiji's alchemist. She was the daughter of an alchemist, but was selected by the woman-eater Hyakuganmaoh. She was saved from this fate by Kougaiji, and has since sworn her life to his service. She also takes the role of 'babysitter' of Kougaiji's sister Lirin. Her weapon of choice is a short spear, explosives and various poisons. In volume two of the manga, she attempts to eliminate the Sanzo Ikkou, first by poisoning their food, then gassing them. Her main fighting opponent is Hakkai, who is much similar to her in terms of personality, calm and collected. Curiously, she somewhat reminded Hakkai as his deceased lover Kanan. Also, both are sometimes seen fighting alongside each other, instead of against, also with the whole Sanzo Ikkou. However, she made it clear that she's completely devoted to Kougaiji.